ARIES (March 21-April 19): Isaac Newton is regarded as one of the most influential scientists in history. But the time he spent as a member of the English Parliament was undistinguished. The only public comment he ever made while serving there was a request to close the window because he was cold. Basketball star Michael Jordan had a similar schism. In the prime of his outstanding career, he took a year off to try playing baseball, which he did poorly. After analyzing 2013's astrological aspects, Aries, I'm guessing that you should cultivate a firm intention to avoid doing what Newton and Jordan did. Keep playing to your strengths and emphasizing what you love. Don't get sidetracked by peripheral concerns. TAURUS (April 20-May 20): In 2013, I'd like to help you cultivate an even more reliable relationship with your intuitions and hunches than you already have. You may not need much guidance from me, since the astrological omens indicate this will happen quite naturally. There's another kind of inspiration I hope to offer you in the coming months: clues about how to be "bad" in ways that will give your goodness more vigor. And when I say "bad," I'm not referring to nastiness or insensitivity, but rather to wildness and playfulness and experimentation. Here's one further service I want to provide, Taurus: helping you build a greater capacity to receive gifts, blessings, and support. 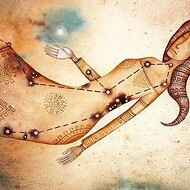 GEMINI (May 21-June 20): In the year 1900, few people believed that human beings would ever fly through the sky in machines. Most scientists thought that such a feat was impossible. For years, the Wright Brothers had a hard time convincing anyone to believe their flights were actually taking place, even though they had photos and witness reports as documentation. Although the leap you'll be capable of in 2013 isn't quite as monumental as the Wright Brothers', it could be pretty important in the history of your own life. You may also have to deal with skepticism akin to what they had to face. Be true to your vision, Gemini! CANCER (June 21-July 22): In 2013, I predict you will see why it's wise to phase out an influence you have loved to hate for far too long. Uncoincidentally, you will also have a talent for purging emotional burdens and psychic debris that you've been holding on to since the bad old days. No later than your birthday, if all goes well, you will be free from a subtle curse you've been casting on yourself; you will finally be attending to one of your long-neglected needs; and you will have turned some rather gawky, half-assed wizardry into a smooth and silky magic. LEO (July 23-Aug. 22): In 2013, I pledge to help you raise your lovability. It's not that you are unlovable now, of course, but there's always room for improvement, right? And if people become even more attracted to you than they already are, then you're likely to get a lot of collaborative and cooperative work done. You will thrive as you and your allies work on projects that make your corner of the world a better and more interesting place. So what are the first three actions you could take to raise your lovability? VIRGO (Aug. 23-Sept. 22): First question: Have you ever thought to yourself, "I'm afraid I will never achieve my noblest dreams or live according to my highest ideas"? Answer: There's a very good chance that in the coming year you will banish that fear from the sacred temple of your imagination. Second question: Have you ever wondered if maybe you unconsciously undermine the efforts of people who are trying to assist you? Answer: In the coming months you should discover exactly what to do to prevent such a thing from happening. Third question: Do you know the single most important question you should be asking in 2013? Answer: I predict you will figure that out sometime in the next three weeks. 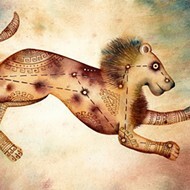 LIBRA (Sept. 23-Oct. 22): In 2013, I will be encouraging you to journey into the frontiers and experiment with the unknown. I will seek to inspire you to go in search of teachings you've needed for a long time. Are you ready for this expansion, Libra? Are you feeling a natural urge to explore forbidden zones and discover missing secrets and mess with your outmoded taboos? As you might imagine, doing this work would motivate you to develop a healthier relationship with your fears. To bolster your courage, I suggest you find some new freedom songs to sing. SCORPIO (Oct. 23-Nov. 21): In 2013, I will do what I can to ensure that your fiscal biorhythms are in close alignment with the universal cash flow. You should have pretty good instincts about this worthy project yourself, Scorpio. And so there's an excellent chance that your wealth will increase. The upgrade will be especially dramatic if you are constantly scheming about how you can share your riches and benefit other people with your generosity. I think there will also be an interesting fringe benefit if you maintain maximum integrity as you enhance your access to valuable resources: You will develop a more useful relationship with your obsessive tendencies. 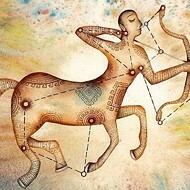 SAGITTARIUS (Nov. 22-Dec. 21): In 2013, I pledge to conspire with you to achieve more mixtures, connections, accords, and unifications than you ever thought possible. I will furthermore be a fount of suggestions about how you can live well in two worlds. I will coach you to create a peace treaty with your evil twin and your nemesis, and I will help you develop a knack for steering clear of other people's bad ideas and sour moods. I can't of course guarantee that you will never again experience a broken heart, but I swear I will do everything I can do to heal the broken part of your heart that you've been suffering from. CAPRICORN (Dec. 22-Jan. 19): When he was 21, the Capricorn writer Jack London set off to prospect for gold in the 1897 Klondike Gold Rush. He had a rough time there. Malnourished, he suffered from scurvy and leg pain. To make matters worse, he didn't find much gold, and returned home broke. On the other hand, he met scores of adventure seekers who told him stories of their travels. These tales served as rich raw material for his novel The Call of the Wild, published in 1903. It made him famous and is generally regarded as his masterpiece. I'm guessing you will begin a similar trajectory in 2013, Capricorn. Events that may at first seem less than successful will ultimately breed a big breakthrough. AQUARIUS (Jan. 20-Feb. 18): I can't force you to seek more pleasure in 2013. I won't nag you to play harder and explore the frontiers of feeling really good. However, I will say this: If you don't plan to put yourself into at least partial alignment with the cosmic mandate to have maximum fun, you may not get the best use out of the advice I'll be offering though my horoscopes in the coming year. Please consider the possibility of ramping up your capacity for pure enjoyment. PISCES (Feb. 19-March 20): The study of ancient Mayan civilization owes a lot to the fact that Americans started buying lots of chewing gum in the late 19th century. Huh? Here's the connection: For a long time, chicle was one of the prime ingredients in Chiclets, Juicy Fruit, Bazooka bubble gum, and many other brands of chewing gum. Chicle is obtained from the sap of sapodilla trees, which grow in abundance in Central America and Mexico. Over the decades, workers harvesting the chicle accidentally found many Mayan ruins covered in overgrown vegetation, then told archaeologists about their discoveries. I foresee a metaphorically comparable sequence happening in your life during 2013. In unexpected ways, you will be put back in touch with and benefit from lost, forgotten, or unexplored parts of the past.